Water is the biggest problem when using linoleum in a kitchen. Made from natural materials, the surface of Linoleum is porous and will absorb spills and liquids, which can then damage the tiles irrevocably. When a Linoleum floor is installed in a kitchen, it should be coated with a clear acrylic sealer as soon as any adhesives used are dry, and before walking on it. A Linoleum kitchen floor needs to be resealed annually in order to maintain the quality and appearance of the material. Linoleum is not appropriate in below grade kitchen flooring. The annual application of an acrylic sealer should make a linoleum kitchen floor resistant to stains and impervious to most water penetration. In the case of excessive flooding due to washing machine malfunctions or pipe leaks, even a properly sealed linoleum floor may suffer some staining or warping damage from water penetration. With Linoleum tile, individual pieces can be removed and replaced when damaged. Day to day maintenance of a linoleum kitchen floor is relatively simple. It can be swept or vacuumed clean on a regular basis. For stains spot, cleaning can be achieved with a ph balanced non-abrasive cleansing agent. While it is not recommended that you immerse a linoleum floor in water, it can be cleaned with a damp mop about once a month. Linoleum kitchen floors need to be sealed with an acrylic sealing agent annually to ensure that they are protected against water damage. The sealant can be poured into a paint tray, and then applied using rollers, starting at the far side of the room away from the exit, and slowly working your way back. Allow the sealer to dry completely, until it is no longer sticky to the touch, before use. For new floors or kitchen floors that have not been treated in several years, the second coat of sealer can be applied to ensure complete coverage. One of the biggest reasons that Linoleum went out of style in the early 1950s is that it had a perception problem. 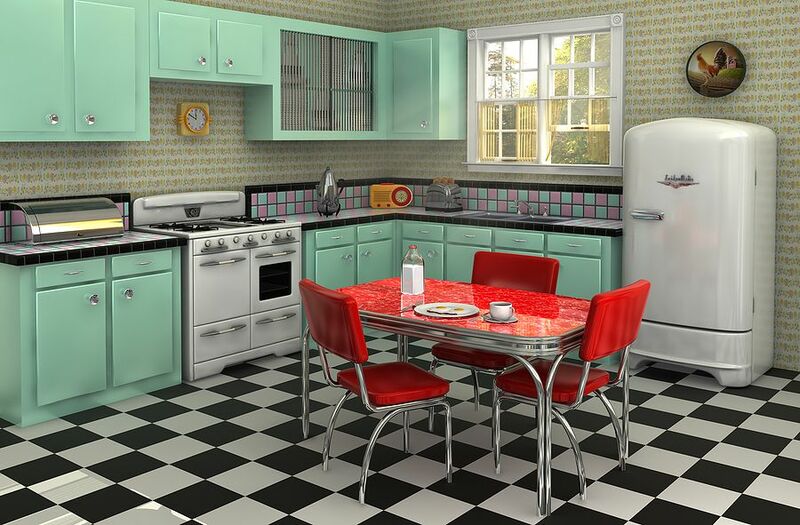 At that time Linoleum had been a standard flooring material in kitchens for over 80 years. While it was very durable and resistant, people were starting to get tired of the standard old look. By contrast, rubber, vinyl, and other innovative flooring materials were just coming onto the market with exciting new designs. This was exacerbated by the fact that there were a number of low-grade materials being manufactured and marketed under the Linoleum name. People would install these in their kitchens, and then when they started to warp, crack, and fall apart, Linoleum would get the negative credit. However, real, high-grade, quality Linoleum still has all of the same benefits that it had back when it was first offered in the 1800’s. While it is not as popular, it is still used in many residential kitchens and is actually quite popular in high traffic commercial solutions, where it can last for as long as forty years. There is also one added advantage to linoleum in a kitchen. Because it has a long and varied history, this material will often fit in with classic or retro style designs better than vinyl, rubber, and other newer, more modern flooring choices. Many people actually believe that the recent resurgence in Linoleum’s popularity is due to the natural cyclical nature of design. Eco-Friendly: This is one of the major characteristics that has caused Linoleum surge in popularity in recent years. Made from easily renewable, natural materials, the manufacture of Linoleum does not cause significant harm to the environment. At the end of its life cycle, which can last up to 40 years, Linoleum can also be biodegraded naturally or used as a clean burning fuel source. However, there are some concerns as to the toxic nature of certain chemicals added to some types of modern linoleum products. Healthy: One of the natural characteristics of Linoleum is that it is antimicrobial, and it will naturally inhibit the growth and spread of harmful microorganisms. It also tends to be anti-static, so that dust and dirt do not cling to its surface, causing a breathing hazard for those with respiratory problems. Durable: Properly cared for, linoleum kitchen floors can last for 30-40 years, and still look as beautiful as the day they were installed. Unlike other flooring, colors in linoleum go all the way through the dimensional body of the material, which means that they stay vibrant, and in some cases grow even more vibrant, over time with wear and tear.